Several people were killed Saturday in a blast at new Ethiopian Prime Minister Abiy Ahmed's first rally in the capital attended by tens of thousands of people, state media reported. Abiy had just wrapped up his speech in the heart of Addis Ababa when the explosion went off, sending panicked crowds towards the stage as the prime minister left hurriedly, apparently safe and sound. "All the casualties are martyrs of love and peace," Abiy was quoted as saying by state-affiliated Fana Broadcasting Corporate. The cause of the blast was unknown and further details on the casualties were not immediately available. It was Abiy's first public speech in the capital since he took office in April, although he has made several in provincial areas. In the past three months, Abiy has made major changes in Ethiopia including shaking up the security services, releasing jailed dissidents, moving to liberalise the economy and to resolve a two-decade conflict with arch-enemy Eritrea. "Ethiopia will be on top again, and the foundations will be love, unity and inclusivity," he declared on Saturday, dressed in a green T-shirt and a hat. After the blast, dozens of people stormed the stage, hurling various objects at police, shouting: "Woyane down, down," and "Woyane thief", using a pejorative term for the government, the AFP correspondent said. 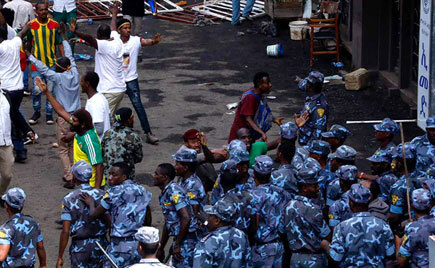 Abiy succeeded Hailemariam Desalegn, who resigned in February amid a wave of anti-government protests led by the country's two largest ethnicities, that started in late 2015 and left hundreds of people dead. His actions since coming to power represent dramatic shifts in the power balance within Africa's second-most populous country. But it remains unclear how deep Abiy's support runs within the ruling Ethiopian People's Revolutionary Democratic Front (EPRDF) for carrying out the reforms. On Friday, Ethiopian opposition group Ginbot 7 announced it would cease armed attacks in the country following the reforms announced by the new government. Last month, Ethiopia released from prison top Ginbot 7 official Andargachew Tsige. Prosecutors also dropped charges against the group's leader Berhanu Nega, who is based outside Ethiopia and had in 2009 received a death sentence in absentia over an assassination plot. "Our forces have received strict orders to refrain from any sort of armed resistance," the group said in a statement. Formed after a disputed 2005 election, Ginbot 7 -- named after the date in the Ethiopian calendar when the ballot took place -- has claimed numerous deadly attacks in the past.